TRAP DESCRIPTION: Trap which measures 8 inches tall by 24 inches wide by 84 inches long. 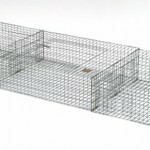 Constructed of 14 gauge wire, this 3 sectionalized trap is strong enough to handle pigeons for many years yet light enough so that one person can fold and carry it for easy relocation. It utilizes a new "one way" door system which works very well on pigeons. The trap has three equally sized sections. The two outside sections have 6 main entry doors and 2 inside doors that lead to the middle section only. Pigeons will enter through any of the twelve outside doors and from there funnel into the mid section where they can be removed. The mid section has four doors only which lead to the outside sections and not to the outside of the trap. The mid section is also the only section which has a large access door on top for bird removal. The doors which lead into the mid section are one way doors as well so that birds which enter the mid section are then trapped and cannot get back to the end sections. WHERE TO USE IT: On the ground, on roof tops, on asphalt and basically anywhere you are able to establish a feeding location for pigeons. If you already have such a location, make sure it will be a large enough area to hold the trap as well as being accessible for getting the trap to the location. RATE OF APPLICATION: Each trap can hold up to 100 birds. Like all live traps, it is best if you establish a feeding location prior to setting the trap out.